With his hands drenched in sweat moments after taking his boxing gloves off, Anthony Lanier worked quickly to catch his breath. Lanier sparred with members of the Washington Redskins' equipment staff for several rounds after practice and believes days of the boxing exercises are making an impact on his game. Boxing is all the rage at Redskins camp, introduced by new defensive line coach Jim Tomsula to help players improve hand speed, footwork, moves and conditioning. The intense, enthusiastic Tomsula believes it helps linemen by making their hands more aggressive, eyes sharper, hips stronger and whole body balanced and better-conditioned. Linebacker Junior Galette's been on the Washington Redskins roster the past two seasons but never played a down. He's coming off two Achilles but hopes this is the season he picks up where he left off. Sherree Burruss reports. “When you go three rounds in three minutes, you're getting some conditioning and it's in a competitive, fun way,” Tomsula said. Fun, Joey Mbu said, is subjective. A.J. Francis called it exhausting. 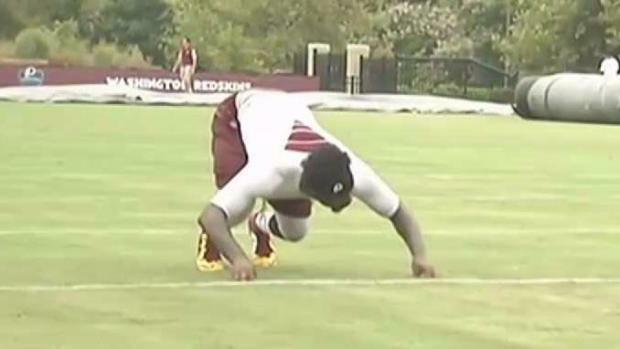 But across the line of scrimmage, left tackle Trent Williams knows it is working. 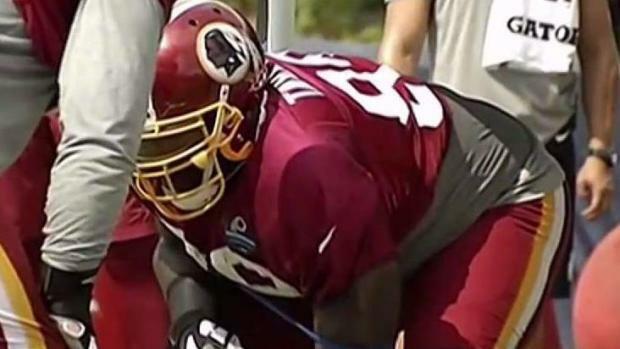 Washington Redskins defensive lineman Phil Taylor returned to the DMV as he tries to return to the NFL and he gives back to the community by hosting camps. Sherree Burruss reports. Technique-wise, Lanier feels that boxing is making his punch more explosive and helping him feel more game-ready. His fellow linemen might not enjoy the breath-sucking activity, but they understand there's a method to Tomsula's approach. 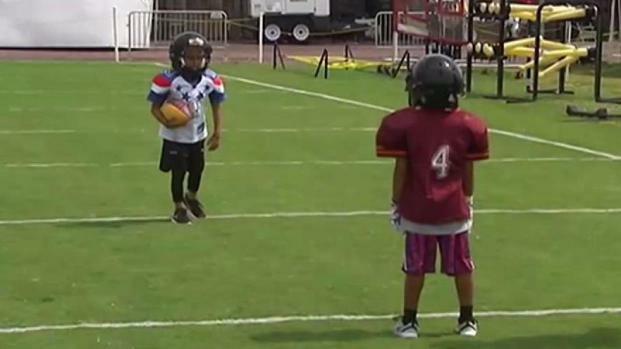 DeAngelo Hall took his young twins to Washington Redskins training camp. They put on pads for the first time and got on the practice field. Sherree Burruss reports. That's the point. Tomsula, who was the 49ers' defensive line coach for eight years before one ill-fated season as head coach, has done this for a long time. When he and new strength and conditioning coach Chad Englehart brought the idea to coach Jay Gruden, he was all for it. Childhood friends Josh Norman and D.J. 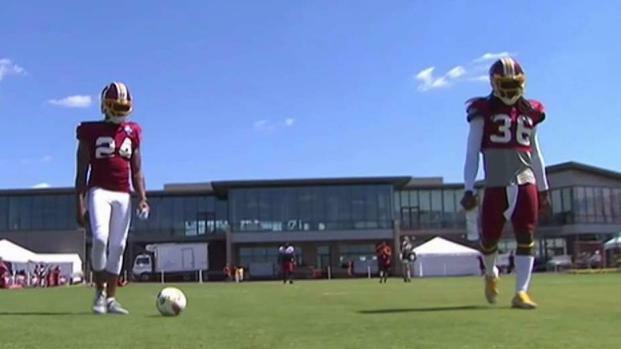 Swearinger are playing football together again in the Washington Redskins defensive backfield. Carol Maloney has their advice for others who want to follow in their footsteps. As the Redskins' defensive linemen jockey for positioning at a crowded position, Francis is glad Tomsula brought in the right equipment and approach to make boxing work. It's exhausting yet effective. First-round pick Jonathan Allen feels his hand speed getting quicker after boxing for several days, and it's clear at practice that the defensive line is showing improvement. 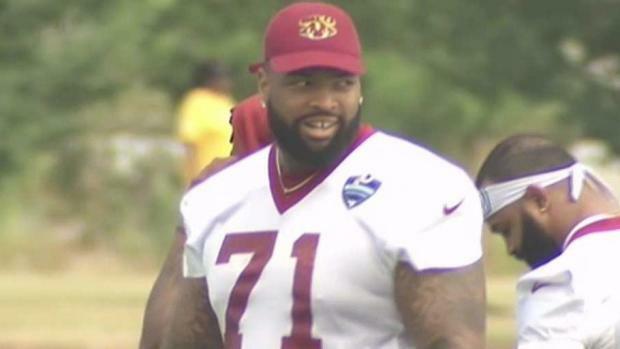 Looking for new ways to improve, five-time Pro Bowl tackle Trent Williams is now a vegan. Carol Maloney reports on that and more from Richmond. Lineman Ziggy Hood, whose given name is “Evander,” can't punch like Holyfield -- the former heavyweight champion -- but he isn't worried about that.